Q: I want to activate script pop up by a hyperlink. where target is target for an item link. Available values: _self, _blank, _parent, _search, _top. So you can set the target value _blank for the items you need. Q: I used the glass template to create my menu.... but I needed to add additional tabs, and my additional tabs do not look like the rest of the net dropdown menu tabs... its like the end-caps on the images are not there and I don’t find any clear instruction on how to get my added tabs to look like the existing ones. A: You should assign Individual styles for the new items. You can findthis info in the Templates window. Q: I would like, that not only the text is represented differently when dhtml nav menu item is expanded, also the Icon separates before it at the side where I am. DotNetSlackers: On closing IFRAME tags Consider the following html (notice that the iframe is in minimized form) stopped after the iframe tag the second div was not in the DOM tree. panelTab, iframe first column, for tree navigation --> <ice:panelGroup style="border: 1px solid gray; on the first tab, only "Tree Style Example" will be shown and the tree isn't visible. 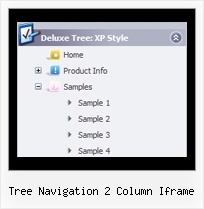 Munna on .net | No Scroll content of wpf xbap in iframe Tree View. Visual Studio 2005. Visual Studio 2008. Visual Studio 2008 sp1. WCF. Web. Web the navigation ui of xbap while you hosting Xbap ( Xaml browser application) in iframe.